Fast forward 40 years after Burnett’s passing, and we find ourselves in the Age of Social Media Marketing, where involvement and relevance are the currency of the land, especially for businesses, small and large. A lot of their money is spent on advertising and marketing in ways that would have seemed alien to someone like Leo Burnett in the days of yore. We’ve gone from radio spots and periodical ads to targeted brand presence on Facebook, bidding for PPC words, and creating display ads. The advertising times have changed, indeed. For Internet giants like Facebook and Google, earning advertising revenue from businesses is like Santa Claus sliding down a chimney everyday with a sack full of money, and let me tell you, Santa has been kind this year. For Q3 2011, Google reported a 24 percent increase in paid search advertising over the same period last year, which marks a rebound from a small lull in ad spending in the previous quarter. Google also reported quarterly earnings of $9.27 billion. Facebook is following suit with strong overall revenue projections with an expected $4.27 billion earned this year, with $3.08 billion from worldwide advertising on the social networking site. According to eMarketer, this represents an 104% increase over 2010. What do all these numbers mean? More and more businesses are finding ways to not only to reach broader audiences, but to engage with them in ways businesses logistically could not even imagine 10 years ago. Don’t believe me? According to the projections made by eMarketer, Facebook’s paid advertising has increased five fold…in two years. The proof is in the pudding considering Facebook has 9.2 million business profiles that engage, on some level, in social media marketing. It’s safe to say that businesses are keen to recognize the importance of online advertising as is evidenced by the astronomical amount of money businesses are spending on being seen. Piggybacking on this week’s revenue report is a surprising statistic that is sure to make any PPC analyst giddy. Google saw a 57 percent increase in click-through rates (CTR), which could mean one of two things, or both: Google is becoming better at matching ads with relevant queries and people are becoming more effective at AdWords bidding. I am of the opinion that increases in CTR for ads on Google will either show sustained growth or continue to increase as they did this past quarter. How is that possible, you ask? The answer is simple: +1’s. This is the part of the story when ads get social. Earlier this week, Google began displaying +1’s on ads appearing on Google Display Network sites. This adds a certain social cue to online display advertisements as they show the other Google+ users who have also +1’d the ad. This is a tremendous development in the world of online advertising due in part to the fact that people are more likely to click where friends have previously clicked. 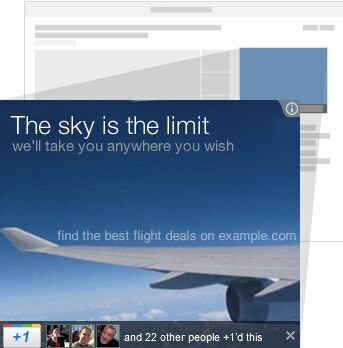 A trust is built between the user and the advertisement when someone sees his friends have +1’d a display ad. If people adhere to the ad’s social cue, it will get an added boost in the auction, providing a greater chance of showing on a page. Following that logic, display ads with +1’s will have a higher click-through rate than ones that don’t. It is worth noting that Google does allow you to opt out, but my advice to anyone who is using AdSense and Google Display Network, and is serious about getting any traction on ad campaigns going forward, is to embrace the +1. Without it, you might as use a carrier pigeon to deliver brand messaging. Plus, with Google delivering more and more local results, it is pertinent that brick-and-mortar businesses develop a strategy to advertise with Google. Display ads with social cues will give a local business greater reach, especially now that Google+ has breached 40 million users. Speaking of advertising with social networks, Facebook is making it incredibly easy for small businesses to advertise on their social network. Together with the US Chamber of Commerce and the National Federation of Independent Business, Facebook will educate small businesses on the value of advertising on Facebook, effectively pushing online marketing beyond operating a brand page. The Facebook Marketing Bootcamp teaches small businesses how to effectively establish and advertise in a social networking space. Facebook, in effect, is giving the old advertising sales pitch, and who could blame them? Facebook gets its ad revenue and small business get much needed online exposure given the fragile economy. Facebook allows businesses to target friends of fans for advertising opportunities, which is important for engaging an audience that would otherwise exist beyond the reach of a business that does not advertise. Take, for instance, Coca-Cola. Coke is one of the most followed brands on Facebook with over 36 million “fans” – that’s approximately the population of California. Why would Coca-Cola stop at targeting 36 million when they can engage in an expanded network of 100 million? Spending money on social media advertising is as much about receiving a business boost as it is about getting involved in an expanding community, remaining relevant, and building trust. Embrace the +1 – Google is making it increasingly easy to start online ad campaigns, specifically with display ads. And who knows, those pesky little +1s could make all the difference when click-through rates skyrocket. Facebook Wants You, Enlist Now – Bootcamp may be the place to get your small business and your website in gear. Plus, Bootcamp is free and Facebook is giving away rebates for advertising with them. Everyone wins. Keep the Social Advertising Faith – Dollars spent in social media marketing don’t always directly equate to dollars earned. The result is engaging an online audience and building brand visibility. Since its beginning, Coke has found unique ways to garner attention. If they are making a sack of money advertising on facebook, it can work for others. I agree with you, fredericka. The resemblance that ads bear to actual content is uncanny. I can only speculate as to the effect this will have on bounce rates. Matthew, good points. Its not just that people are more social on the web and phone, its that social media ads look less like ads and more like content, that’s why they work. These mediums that have taken off and include Facebook, Adblade Ads, Linkedin Ads etc. What do they all have in common? They all look like content…not like display or banner advertising. I actually researched the influence of social sharing – in the majority of cases it is a bump of +7 – +10 on a given SERP. +1 data is currently the only social metric applied to SERP personalization, so this bump may increae as time goes on.